Why is it so difficult to know that you are saved? For years, J.D. Greear thought he was alone in his struggle to find assurance of salvation. But after countless conversations with Christians of all ages, he has concluded that a lack of assurance is epidemic. Could truncated and sometime careless ways we explain the gospel be contributing to the problem? In Stop Asking Jesus Into Your Heart, J.D. explains that reducing conversion to a prayer often grants assurance to those who shouldn't have it and keeps it from those who should. The sinner's prayer can be a useful expression of repentance and faith, but it can never replace it. Why is it so difficult to know that you are saved? For years, J.D. Greear thought he was alone in his struggle to find assurance of salvation. But after countless conversations with Christians of all ages, he has concluded that a lack of assurance is epidemic. Could truncated and sometime careless ways we explain the gospel be contributing to the problem? In Stop Asking Jesus Into Your Heart, J.D. explains that reducing conversion to a prayer often grants assurance to those who shouldn't have it and keeps it from those who should. The sinner's prayer can be a useful expression of repentance and faith, but it can never replace it. "Salvation is a serious issue. Scripture commands us, on the one hand, to 'work out our salvation with fear and trembling' and, on the other, paints beautiful pictures of believers walking in great assurance. J.D. helps us see what conversion really is and what it is not. This book will be a help for those who wrestle with their position before God and a wake-up call for those with false confidence. I recommend it highly." "Warmly personal. Immensely helpful. Wonderfully practical. Thoroughly biblical. I wholeheartedly recommend this book to every Christian who longs to know, experience, and spread assurance of salvation in Christ." "So much emphasis today is on the power of personal persuasion in sharing the gospel. What to say, how to say it. Reasons to believe, proofs for the authority of scripture, methods for gaining credibility blah blah blah. Pick up a copy of my friend J.D. Greear's book and learn the marks of a person saved by Jesus Christ. I commend it to you." "Outstanding! This is a truly useful book. It's readable, engaging and packed with scriptural insight. It not only gives hope to Christians struggling with assurance of salvation, it will equip any Christian to better share the gospel and guide others toward genuine repentance and faith in Jesus." "Don't let the provocative first half of the title scare you away from reading this important book! Emanating from his own personal and pastoral experience, yet with feet firmly planted in the sufficiency of Scripture, Greear is far more interested in helping us have genuine biblical assurance of salvation than anything else. He rightly reminds us we must emphasize the absolute indispensability of repentance and faith as necessary for salvation. Though I might quibble over a few things I would express differently, the vast majority of J.D. 's book I wholeheartedly endorse. Timely, engagingly written, and thoroughly practical, it deserves a place on every pastor's shelf. Buy it! Apply it!" "This is a very helpful and needed book. Untold numbers of people are thinking of themselves as true Christians when really theirs is a false assurance; while others are true Christians but lack a solid assurance. The book spells out how to teach the gospel in such a way as to help avoid these tragic results and how to help deliver those who are experiencing them. The emphasis on clear presentation of the meaning and evidence of repentance and faith is exactly what is needed. Also the difference a genuine assurance of salvation can make in one's life is brought out. I highly recommend this book!" "A sensitive conscience can be a curse from Satan or a blessing from God. Does your conscience drive you from God, or to Him? In this book, J.D. Greear gets the gospel right. And the gospel is the way from conviction to salvation. This book should help you know how to place your conscience in the Lord's hands, where it can be a tool greatly used by God, as it was in Augustine's life, or Martin Luther's." "Every Christian struggles with doubts about salvation. The comforting passages of Scripture, assuring believers of their hope in salvation, were written to build up faith in the face of doubt. Stop Asking Jesus Into Your Heart guides readers through both assurance and perseverance in a life-altering way. Greear's work is both an affront to easy-believism and a spotlight on the promises of God's Word. A comforting wake-up call." "This is a book I wish was available when I turned twenty and had a terrible season of doubting my salvation. By God's grace and the truth of the gospel I was able to settle the issue. I have lived in the full assurance of my salvation in Jesus ever since. God wants us to experience the joyful truth that we are eternally secure in Jesus. This book can help take you there. I will be recommending this book often!" "As someone who works with young people, I often see the pitfall that my friend J.D. 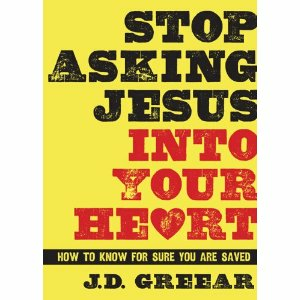 Greear explores in Stop Asking Jesus Into Your Heart; How To Know for Sure You are Saved. I have sat with many eighteen to twenty-four year olds that say they had no clue what they were doing when they repeated a prayer with someone as a young person. As next generation leaders, we have to focus on true life-change, really direction change rather than just a spiritual transaction. I am thankful that J.D. was willing to take on the hard discussions related to salvation and discipleship in this new book." "Stop Asking Jesus Into Your Heart by J.D. Greear is a biblical clarification for the assurance of salvation to the Christian based upon the finished work of Jesus Christ. The invitation to eternal life is more than a prayer! It is a living, breathing, real, relevant, relationship with God through Jesus Christ while being sealed by the Holy Spirit. The gospel saves and sustains! Read, reflect, and rejoice in the ability to know of the assurance of your salvation! "When I first read the title, I was caught off guard-because I am an evangelist who continually urges hearers to repent and ask Jesus into their heart. Once I began to read, however, I began to understand the big idea-praying a prayer of repentance and salvation ought only to mark the beginning of a lifetime of repentance and faith. J.D. wrestles with a tough subject here and does a tremendous job of helping the church come to grips with a salvation not anchored in a one-time prayer but the finished work of Christ." "This book is similar to John Stott's Basic Christianity in that it lays out with clarity and reasoned arguments the path to Christian belief. Stop Asking Jesus Into Your Heart is especially helpful in answering many follow-on questions, too. Faith seekers and faith sharers alike will benefit from J.D. Greear's clear thinking on what effectuates and evidences true salvation in Christ." "Improper methodology and sloppy theology have paralyzed at worst and confused at best many of our churches today when it comes to evangelism. J.D. 's book is not only timely but crucial." "J.D. tackles an incredibly vital topic in our time, but from the front lines of ministry as one who stands unashamed to call people to follow Christ. Read this book and understand with fresh eyes and a hungry heart the wonder of biblical conversion." "I wore out 2 Sharpies worth of ink writing 'Amen & WOW' in the margins of this new book. Chapter after chapter I was encouraged, rebuked, discipled, and compelled to be a better minister of the gospel. Thank you J.D. for this gift to the church." "I have to admit the title of this book made me uncomfortable. It sounded to me like a tract against the so-called 'sinner's prayer,' and I find it biblical to cry out 'Lord have mercy on me, a sinner!' But as I read this book I found that is not what it is about at all. In this volume, J. D. Greear, one of the most dynamic and brilliant pastors in evangelical life today, addresses a common problem among Christians: the sense that we can never get assured enough that Jesus hears our sinners prayer and receives us, just as we are. This book throws the spotlight on Jesus as a welcoming, merciful Savior who joyously receives all who come to Him. This book could help free you, or someone you love, from the nagging fear that Jesus is trying to keep you out of His kingdom."